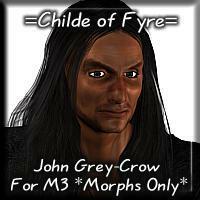 This is an American Indian morph for Michael 3. I was using multiple photo references of Blackfoot members to attempt to get the features right. He only vaguely appears Blackfoot, unfortunately. I just couldn't get Poser to cooperate and get him as carven-looking as he should have been.